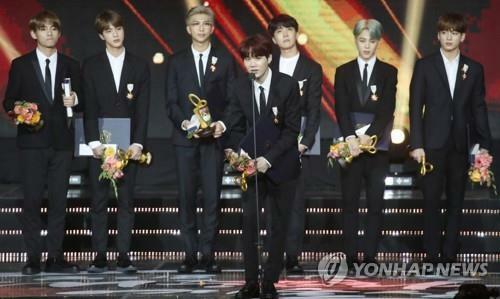 SEOUL, Oct. 24 (Yonhap) — Superstar K-pop group BTS on Wednesday was awarded a cultural medal from the government for its contribution to the promotion of Korean culture worldwide. Cultural Minister Do Jong-hwan gave the medal to the septet at a ceremony at Olympic Hall in Seoul, after the group returned home earlier in the day after a highly successful, 52-day concert tour of the United States and Europe. The BTS members said that they feel honored to receive the medal and will make efforts to further promote Korean culture worldwide. “We’d like to attribute this glory to all Armies,” RM said, referring to BTS fans. Jin said that they feel great about many fans singing BTS songs in Korean and learning Korean. “I will make effort to let Korean culture spread worldwide with the heart of a national representative,” Suga said. During the ceremony, BTS fans were waving noctilucent sticks called “Army Bombs” in their hands and cheered whenever the name of BTS was called or scenes featuring the group appeared on a stage screen. The government gave cultural awards to 36 artists or groups, among which cultural medals were bestowed to 13. “You’re great artists on the grounds that you are affecting the people’s lives,” Minister Do said. “Hallyu” refers to the global popularity of South Korean popular culture, particularly music, movies and television dramas. BTS arrived at Incheon International Airport, the main gateway to Seoul, early Wednesday morning, returning to their home country after departing on Sept. 3 for the “Love Yourself” world tour. Wearing masks and hats and flanked by bodyguards and airport authorities, the members exited the airport without speaking to reporters and went straight to vans that were waiting outside. Some members — Jungkook, J-Hope and V — waved or gave peace signs to cameras as they exited the airport. They remained silent while walking through the airport but made visual statements with their attire. Member Jin showed up in a sky-blue sweatshirt with a print of Mona Lisa, while Suga sported a winter coat and beanie with brooches of the Chanel emblem, both signs of the Paris leg of the world tour. J-Hope wore a white T-shirt with support messages for BTS. Printed with a large image of BTS members, the shirt had the name of BTS member Jimin and the group’s Korean full-name, “Bangtan Sonyeondan,” which means “Bulletproof Boy Scouts,” printed in Korean. The messages of each arm of his T-shirt read, “I support you” and “I love you,” while the back showed the message in pink, “I am an ARMY,” the name of BTS’ fan club. Hundreds of fans waiting behind police lines erupted in cheers as the boy band showed up from the exit gate, screaming messages of support and encouragement, such as “I am proud of you.” Some fans became tearful at the scene. The brief encounter with fans wrapped up in an unusually orderly manner as the ARMY staged a “purple campaign,” taking a cue from the color purple, the representative hue for BTS. A hoard of fans held up cardboard signs near the exit gate, advising against taking close-up photos of BTS, mindful of some fervent fans’ privacy-invading photography, as well as any unexpected accidents at the scene. The signs had messages like “Save in the heart, not in the camera” and “Don’t take close photos.” The messages were also displayed in Chinese and Japanese for fans coming from the neighboring countries. BTS will resume its “Love Yourself” world tour with concerts scheduled for Nov. 13-14 in Tokyo. After performances in Osaka, the group will move to Taiwan for concerts on Dec. 8-9.